Dobie Meadows Road, Mono County, California: 38000. Dobie Meadows Road, Mono County, California: 78000. Dobie Meadows Road, Mono County, California: break in slope. Field Notes: at Adobe Hills Spillway. View to south of the spillway. Adobe Hills Spillway from a distance. Field Notes: 23 Sep 06 near Adobe Hills Spillway. Dobie Meadows Road, Mono County, California: below spillway. The uppermost sediments of Pleistocene Lake Russell (ancestral Mono Lake) were quarried here to aid in construction of Dobie Meadows Road. The car is parked at the highest point. Water from Lake Russell (Mono Lake) would flow over the spillway toward the viewer. Field Notes: 23 Sep 06 at spillway,. West Portal Road, Mono County, California: near W. Portal. West Portal Road, Mono County, California: near rock outcrop. Mono Craters in the background. This is photograph number 2000 on this web site. Field Notes: 23 Sep 06 at Vista Point. U. S. Highway 395: near Aeolian Buttes. Alameda Well and buildings, from outside the fence. Dobie Meadows Road, Mono County, California: near Alameda Well. California Highway 158: at Silver Lk CG. Field Notes: 3 Oct 2013. Three little ducks, probably shovelers, in a spring beside Alkali Lake. Forest Road 058: near Alkali Lake. This grade can be a little rough, and is worth taking some extra time. Forest Road 058: at s. end. Looking north toward the playa in Alkali Valley. The old road can be seen at extreme right. Forest Road 058: near old road. Delta of Andy Thompson Creek. The plateau barely highlighted in the right middleground looks to me like a former delta of Andy Thompson Creek built during a higher stand of Mono Lake. Field Notes: Andy Thompson Ck. I think the highest peak in the distance is Parker Peak. View southwest from the "Sand" marker. Big Sand Flat can be seen at left. Forest Road 1S19A can be seen left of center. The vegetation change is the result of a fire. Intersection of CA Highway 120 and "120 Cutoff Road," F. R. 1S06. California Highway 120: at FR 1S06. "120 Cutoff," Inyo Forest Road 1S06, Mono County, California: near CA Hwy120. Sand dunes on the edge of Big Sand Flat. Photograph taken 17 June 2010. Forest Road 1S19B (1S181), Mono County, California: near sand dunes. Field Notes: 17 June 2010. This area burned several years ago. Forest Road 1S19A, Mono County, California: on bench. This looks like some kind of water collection device, such as a Guzzler. However, the water collection pan looks small relative to the storage pit. Big Sand Flat, from the southwest. The road at right is Pilot Spring Road. California Highway 120: near Big Sand Flat. Big Sand Flat, looking into the Mono Basin from near Sagehen Summit. Eastern portion of Big Sand Flat after sheep grazing. Forest Road 01S27K, Mono County, California: in Big Sand Flat. Wildlife exclosure (?) in Big Sand Flat. I also saw something similar to this in Alkali Valley. California Highway 120: in Big Sand Flat. Field Notes: 25 June 2007 at Big Sand Flat. Wildflowers at Big Sand Flat. The magenta-colored flowers are Skunky Monkey Flower (Diplacus mephiticus (Greene) G. L. Nesom) and the blue flowers are Mono Lake Lupine (Lupinus duranii Eastw.). Field Notes: 7 July 2009 at Big Sand Flat. Field Notes: 8 July 2009 at Black Point. Forest Road 02N42 “Black Point Rd.” , Mono County, California: near Cemetery Rd. There are two valleys formed by moraines that can be seen exiting Bloody Canyon. Walker Lake and Walker Creek are in the largest valley that exits to the right. Moraines forming this valley have been dated as Tahoe, Tenaya, and Tioga age. Exiting to the left is the older moraine that defines Sawmill Canyon. This moraine has been dated as Mono Basin age by Sampson and Smith (2006). The peak on the left is Mount Lewis, and the peak on the right is Mount Gibbs. California Highway 120: near Panum Crater. Field Notes: 23 Sep 06 near Panum Crater. A Checklist Flora of the Mono Lake Basin, Mono County, California and Mineral County, Nevada. : Walker Lake. Inyo Forest Road 01N54 “East Shore Road”, Mono County, California: along RR grade. Field Notes: 24 Jun 2015. Bodie and Benton Railway roadbed. Inyo Forest Road 01S91 “Old Stationhouse Road,” Mono County, California: s. of Mono Mills. Field Notes: s. of Mono Mills. Spike pattern in railroad tie. Unknown Forest Road, Mono County, California: where the antelope play. Photograph taken 25 July 2010 in the Bodie Hills, about midway through Cottonwood Canyon. Cottonwood Canyon Road: at miners cabin. Map prepared 30 July 2010. Unknown Forest Road, Mono County, California: map. Mats of Lupinus lepidus var. lobbii are in the center foreground. Looking east into the Mono Basin. California Highway 270: 21 Jun 2012. Field Notes: 21 Jun 2012. Photograph taken 18 June 2010. Field Notes: in Bohler Cyn. Second collecting locality in Bohler Canyon. This is the place where a small road crosses the creek. There is also a broken down cabin here. Forest Road 01N106A, Mono County, California: at s. Bohler Cyn Rd. I think it's Mount Gibbs on the left, and Mount Dana on the right. Forest Road 01N106A, Mono County, California: at stream crossing. Field Notes: 2-Aug-07 in Bohler Cyn. Forest Road 01N106A, Mono County, California: at arborglyph. Field Notes: near Bohler Creek. Photograph looks north from the south side of the canyon, across Bohler Creek. The GNIS does not recognize a “Bohler Creek.” Regardless, this is the creek draining from Bohler Canyon, which the GNIS does recognize. Forest Road 01N17, "Farrington Siphon," Mono County, California: at Bohler Ck. Field Notes: at Bohler Ck. Photograph taken 20 June 2010. Coyote Springs Road, Mono County, California: on sm. Mesa. Field Notes: Coll. No. 602, 20 Jun 2010.. This meadow was watered by a fairly large spring that does not appear to be named. Coyote Springs Road, Mono County, California: above unnamed spring. Coyote Springs Road, Mono County, California: in Bridgeport Cyn. Photograph taken 26-Jun-07 from Goat Ranch Cutoff. Coyote Springs Road, Mono County, California: at Goat Ranch Cutoff. Goat Ranch Cutoff, Mono County, California: at Coyote Sprs Rd. Field Notes: 26-Jun-07 at Bridgeport Cyn. Plants collected in one spot in Bridgeport Canyon. Date of Collections: 22 May 2013. Note that the Iris is still there; eventually it will take over. It looked like the water had been pumped out; for sheep? View of Cedar Hill acress Mono Lake. Cedar Hill is in the middleground from center to right of center. The peak on the skyline left of center is Mount Hicks. The peak at back left is Aurora Peak. Both of these peaks are in Nevada. California Highway 167: s.w. of Cedar Hill. A Checklist Flora of the Mono Lake Basin, Mono County, California and Mineral County, Nevada. : Cedar Hill. Chesnut and Drew in the Mono Lake basin, 1889. Conway Ranch Road: at Conway Ranch. Dunderberg Peak in the background. Conway Ranch Road: east of Conway Rch. Conway Ranch Road: near Conway Ranch. Field Notes: 22 Jun 2012. East face of Copper Mountain. The Other Cemetery Road, Mono County, California: out there somewhere. Field Notes: 20 Jun 2011. Field Notes: near Copper Mtn. U. S. Highway 395: near Copper Mountain. The Other Cemetery Road, Mono County, California: Cemetery. Field Notes: 22 Jun 2011. Unnamed Road to Mine, Mono County, California: at mill site. Field Notes: at Mill Site. Cottonwood Canyon Road: in Cottonwood Canyon. Field Notes: in Cottonwood Canyon. Flow of water would be toward the viewer. As you can see below, there indeed a few cottonwoods in Cottonwood Canyon. In the left middle ground, the light-colored patch is the playa where later in the day I will collect the little caespitose lupine, my collection number 487. California Highway 270: along CA Hwy 270. A Checklist Flora of the Mono Lake Basin, Mono County, California and Mineral County, Nevada. : at Cottonwood Cyn. Murphy Spring drains into Mono Lake by way of Cottonwood Canyon. California Highway 270: Murphy Spring. The brown hump in the left middleground is Black Point, a surtseyan volcano. The snow covered peak in the center is Mount Warren, with Lee Vining Peak at left, and Mount Gilcrest at right. The broad plateau below Mount Warren is a likely relict terrain from the relatively recent Sierran uplift. I have heard it called the “Warren Bench.” However, GNIS does not supply a name for this feature, but does recognize a “Warren Bench” to the south, just west of Big Pine, California. Forest Road 02N108, Inyo National Forest, Mono County, California: at ponds. Field Notes: 5 Oct 2013. This is an artificial pond; source of water is unknown to me. Negit Island is in the center middle distance. Mono Craters in the right distance, and in the left distance the light colored area shows the extent of the Indian Fire of 2012. Cowtrack Mountain Road, Mono County, California: on flat near top. California Highway 120: east of Gaspipe Spr. Cowtrack Mountain Road, Mono County, California: on CA Hwy 120. Field Notes: east of Gaspipe Spr. Cowtrack Mountain as seen from Rush Creek delta. One reason to care about the visually ignoble Cowtrack Mountain is that it represents the southeast margin of the Mono Basin. This photo, taken just above the switchback on Cowtrack Mountain Road, shows California Highway 120 in the foreground valley, Sagehen Meadow in the middle distance, and Sagehen Peak on the left distance. Cowtrack Mountain Road goes down to the water tank, turns left, and then climbs out of this little valley back into the Mono Basin. Straight ahead, the little valley drains through Granite Basin into Adobe Valley. Cowtrack Mountain Road, Mono County, California: near the water tank. Cowtrack Mountain with the top burned off by the Indian Fire of 2013. California Highway 120: at McGee Cyn. "Taylor Canyon Road," Inyo Forest Road 1S17, Mono County, California: near head of meadow. Field Notes: 18 June 2012. Looking north into the Mono Basin from Deadman Summit. Deadman Summit in the southbound direction. Forest Road 1S05, "Bald Mountain Road," Mono County, California: near US Hwy 395. Forest Road 02N20 “Dechambeau Ranch Road,” Mono County, California: at Black Pt Rd. Forest Road 02N42 “Black Point Rd.” , Mono County, California: near 02N20. Humboldt-Toiyabe Forest Road 181 "Jordan Spring Road," Mono County, California: near Copper Mountain. Photograph taken 8 July 2010 from crossing of Dry Creek by Forest Road 1S56. Forest Road 1S56, Mono County, California: at Dry Creek. I checked this gate carefully. The chain was intact and it had a USFS lock on it. Since, the chain was intact, I assumed the gate was purposefully left open, and drove through. Forest Road 1S160B (Former 1S438), Mono County, California: near gate. Field Notes: 2010071206505. 23 Jul 2010. This chain had no lock on it; could have been cut off the chain. Forest Road 1S160B (Former 1S438), Mono County, California: at s. end. Road crosses a dry tributary of Dry Creek. Forest Road 1S160 (Former 1S437), Mono County, California: near Dry Ck. California Highway 120: at Dry Creek. Field Notes: 4 Oct 2013. Forest Road 1S160B (Former 1S438), Mono County, California: at spring. Forest Road 02S114, Inyo National Forest, Mono County, California: in s. flat. "Pumice Mine Road," Inyo Forest Road 1S40, Mono County, California: on Mono Craters. Forest Road 1S08, Mono County, California: about mid-way. "Pumice Mine Road," Inyo Forest Road 1S40, Mono County, California: near East Craters Sand Flat. East Craters Sand Flat, looking south from the north end. West end of Forest Road 1S08. Forest Road 1S08, Mono County, California: at 1S40. "Pumice Mine Road," Inyo Forest Road 1S40, Mono County, California: at 1S08. Forest Road 1S08, Mono County, California: at bottom of flat. Forest Road 1S07, Mono County, California: East Craters Sand Flat. Anchor eyes embedded in the ridges of patterned ground. Forest Road 4N01G, Inyo National Forest, Mono County, California: in area of patterned ground. Field Notes: 20 Jun 2012. A Checklist Flora of the Mono Lake Basin, Mono County, California and Mineral County, Nevada. : at Deep Cañon. Inyo Forest Road 3N101, Mono County, California, and Mineral County, Nevada: in Sect. 16. Powerline road just north of Deep Wells. Inyo Forest Road 4N01, Mono County, California: on top of terrace. Field Notes: north of Deep Wells. Oil Plant Road, Mono County, California: near Farrington's. Field Notes: 20 May 2013. Field Notes: 6 Mar 2014. Location of collection nos. 828-831. Photographed 18 June 2012. I think this area was a shoreline delta during higher stands of Mono Lake, and has since been eroded by a stream. Field Notes: 16 Jun 2012. Goat Ranch from the west. Photograph taken 26-Jun-07 from Goat Ranch Cutoff, west of Coyote Springs Road. Goat Ranch Cutoff, Mono County, California: 27000. The building with the long red roof on right side of photo is the original school house (behind picket white fence) that was established in 1897. This is where the early family attended school next door to where they lived. Unfortunately, the fire destroyed this historical landmark in 2009 (Joseph L. Scanavino, personal communication, 2012). Cottonwood Canyon Road: at Goat Ranch. This is the original blacksmith shop used by the early Scanavino family. It was built by my grandfather, Giuseppe (Joe) Scanavino in early 1900s and used by my father until he passed away in 1955. Wagon wheels and horse snowshoes were made in this building, including tools needed for the ranch (Joseph L. Scanavino, personal communication, 2012). Inyo Forest Road 1S104, Mono County, California: 75000. Field Notes: on the moraine. Photograph taken 14 June 2011. Forest Road 01S30, “Grant Lake Road,” Mono County, California: at spillway. Field Notes: 14 Jun 2011. Water spills over the Grant Lake Dam. California Highway 158: near Grant Lake spillway. Field Notes: 2-Aug-08 at Grant Lake. I assume the landform in the center of the photo is a late-stage terminal moraine. Grant Lake from the north shore. California Highway 158: near Grant Lake. Field Notes: 23 Sep 06 near Grant Lake. A Checklist Flora of the Mono Lake Basin, Mono County, California and Mineral County, Nevada. : Grant Lake. It's smoky today due to the Aspen fire set by lightning on Monday, July 22. Field Notes: 24 Jul 2013. It's smoky today due to the Aspen fire set by lightning on Monday, July 22nd. Gull Lake, in the June Lakes Loop. Forest Road 02S93, "Gull Lake Car Top Boat Launch," Inyo National Forest, Mono County, California: near Gull Lk. Gull Lake in the evening. Field Notes: at Gull Lake. Photograph taken 9 Sep 2011. The tailpiece of the windmill says, "Little River Pond Mill." Silver Meadows Lane, Mono County, California: at spur. Billions … Trillions! To conduct wars in Iraq, Afghanistan, Pakistan, and Libya, but no dollars to keep the poopers open in Silver Lake. Photograph taken 10 Sep 2011. California Highway 158: at Silver Lake. No toilet paper in the pooper at Silver Lake. You can bet there was plenty of toilet paper in the halls of Congress. Field Notes: at Silver Lake. Road off the rim of the moraine. The upper portion of this road is really steep. We came down it. I could probably go up, but would rather not. Inyo Forest Road 1S104, Mono County, California: at 1S31. Inyo Forest Road 1S31 “Reversed Peak,” Mono County, California: at 1S104. Photograph taken 20 June 2011, the last day of Spring, June 20, 2011, high on the Horseshoe Canyon Moraine above Grant Lake. Mt. Wood in the background. Rush Creek Road, Mono County, California: at cemetery. Indian Spring after the Indian fire. Spur Road to Indian Spring, Mono County, CA: near Indian Spr. This is the 4000th photograph on my web site. Humboldt-Toiyabe Forest Road 181 "Jordan Spring Road," Mono County, California: near Jordan Spr. Field Notes: 10 Sep 2011. This pond is dry in 2012. California Highway 158: near N. Shore Dr..
North Shore Drive: near CA Hwy 158. North Shore Drive: north side of lake. June Lake in the early morning. During the 1930's, in central Mono County, demand for gaming entertainment skyrocketed with the influx of hundreds of employees working on the Mono Basin project. To accomodate the workers, many local bars and cafes installed slot machines. Although illegal, there (sic) use in Mono County thrived for many years. Unfortunately, upon completion of the aqueduct in 1941 and transfer of all workers, demand for this activity diminished. Within a few years most slot machines were voluntarily removed. It was rumored that the last slot machines were hastily dumped into June Lake in the middle of the night by local merchants in response to an imminent raid by the state revenue agents. However, the legend of the slot machines did not end there. Over the years, numerous attempts to locate them by special cold water dive teams failed. Although no one has recently inserted a coin into one and pulled the handle, many people still gamble on hitting the jackpot and finding these “one armed bandits” at the bottom of June Lake. Forever lost? Time will tell. Location of Lago, a ficticious town in the movie High Plains Drifter. Test Station Road, Mono County, California: near Lago. Larkin Lake from the south edge. Trench Canyon Road: edge of Larkin Lake. Pollywogs, dead pollywogs, and yellow jackets at Larkin Lake. In the center of Larkin Lake, a hole has been scooped out, and resulting hole contained some very green water. There were pollywogs in the water, some of which had front and back legs. But many had died. The yellow jackets were swarming to eat the dead pollywogs. Trench Canyon Road: at Larkin Lake. Field Notes: 23-Sep-06 at Larkin Lake. This is artificial, having been scoped out some time ago. Forest Road 01N21 “Poole Power Plant,” Mono County, California: at Poole Power Stn. California Highway 120: at Aqueduct Intake. Lee Vining Canyon in the early morning. California Highway 120: in lower Lee Vining Cyn. Photograph taken 19 June 2010. Forest Road 01N21 “Poole Power Plant,” Mono County, California: in canyon. Field Notes: 6 Oct 2000 at Lee Vining. Pelton wheel from the Poole Hydro-Electric Station. generated: 19 billion kilowatt hours. Coll. No. 922 is the willow in the middleground. Forest Road 01N21 “Poole Power Plant,” Mono County, California: near AspenCG. Field Notes: Coll. No. 922. Outlet of Lee Vining Creek into Mono Lake. Field Notes: 23 Jul 2013. Access road to Lee Vining Creek delta. Photographed 5 October 2013. The road to this parking lot does not have a Forest Road designation. However, if diverges to the right from the road to Old Marina. It provides a good location from which to explore the northwest side of the Lee Vining Creek delta. Spur Road to Lee Vining Creek Delta, Inyo National Forest, Mono County, California: near pkg lot. Field Notes: 25 Jun 2015. Lee Vining ridge behind the town of Lee Vining, composed in part of the Log Cabin Mine pendant. The Log Cabin Mine pendant is composed of middle Devonian metasediments deposited submarine fan system. Lime Kiln, north shore Mono Lake. Dobie Meadows Road, Mono County, California: at Lime Kiln. Little Sand Flat from burned forested island. Forest Road 1S88, Mono County, California: on forested island. South end of Little Sand Flat. Forest Road 1S88, Mono County, California: at south end of Little Sand Flat. Photograph taken 23 July 2010 in Little Sand Flat. Forest Road 1S88, Mono County, California: in Little Sand Flat. Mono Craters west of Little Sand Flat. Forest Road 1S13, Mono County, California: Little Sand Flat. Little Sand Flat and Mono Craters. Map drawn 29 January 2016. A Checklist Flora of the Mono Lake Basin, Mono County, California and Mineral County, Nevada. : 101010. Inyo National Forest Road 01N16, "Horse Meadows / Gibbs Trailhead," Mono County, California: Upper Horse Meadow. Field Notes: 26-Jun-07 at Lundy. Home of the May Lundy Mine. Site of W. J. Lundy sawmill supplying lumber to Bodie in 1878. Organized as the Homer Mining District in 1879 by Wasson, Nye, and Homer. Plagued by snowslides and partially destroyed by fire in 1886. Lundy's page of Mono County's history reads wild, rugged and raw, but her gold was rich and yellow. Lundy Lake Road: in Lundy. Field Notes: on top of Black Point. Lundy Dam Road, Mono County, California: 30000. Lundy Lake Road: at picnic area. Inset: Leptosiphon nuttallii found nearby. A Checklist Flora of the Mono Lake Basin, Mono County, California and Mineral County, Nevada. : Lundy Cyn. The trail along the opposite bank of the lake goes to the May Lundy Mine. Lundy Lake Road: at Lundy Lake. Field Notes: 26-Jun-07 at Lundy Lake. The little canyon on the other side of the dam contains Deer Creek. Lundy Lake Road: at Lundy Lake Dam. Lower side of Lundy Lake dam. I took this photograph because there are several collections that were described as made just below the dam. Lundy Dam Road, Mono County, California: 25000. McPherson Grade, Mono County, California: near Indian Spr. Field Notes: 23 Jun 2015. View of the McPherson Grade area after the Indian Fire. McPherson Grade, Mono County, California: at pass. McPherson Grade, Mono County, California: near pass. Spur Road to Indian Spring, Mono County, CA: near McPherson. Mill Creek near Mono Lake. Below Cemetery Road, Mill Creek is straight and channelized. Cemetery Road, Forest Road 02N40, Mono County, California: crossing Mill Creek. Mill Creek above Cemetery Road. The gravel bar here has diverted the direct flow of the water and created some habitat for plants. Location of Coll. No. 1013, Myosotis laxa Bay Forget-Me-Not. The Forget-Me-Not was growing on the far side of the little island on the other side of the creek. One distributary of Mill Creek where Coll. Nos. 1007-9 were made. Field Notes: at Mill Ck delta. Forest Road 2N14, Inyo National Forest, Mono County, California: at Frog Rk. Photograph taken 22 June 2011, strongly backlit but, there you have it! Mill Creek Powerhouse Road, Mono County, California: 60000. Photograph: Forest Service, United States Department of Agriculture. A Checklist Flora of the Mono Lake Basin, Mono County, California and Mineral County, Nevada. : at Forest Service Info Ctr. U. S. Highway 395: at Mono VC. Photograph looks north east, directly toward from the lake. Humboldt-Toiyabe Forest Road 181 "Jordan Spring Road," Mono County, California: just n. of Copper Mountain. Construction works for Mono Craters tunnel. "120 Cutoff," Inyo Forest Road 1S06, Mono County, California: over Mono Craters tunnel. Forest Road 1S07, Mono County, California: at edge of sand flat. "Pumice Mine Road," Inyo Forest Road 1S40, Mono County, California: on Pumice Mine Rd. View northwest along 1S38 from Mono Craters to Warren Bench. Inyo Forest Road 1N38, "Devils Punch Bowl," Mono County, California: near 1S38G. Mono Craters from the northshore of Mono Lake. Forest Road 02N19, Mono County, California: nr s end. Field Notes: near Black Pt.. Spur Road to Old Marina, Mono County, California: at Old Marina. Field Notes: near Lee Vining Ck delta. Map showing location of Mono Diggins and surrounding locations. Mill Creek Powerhouse Road, Mono County, California: 64000. About 1 mile N.E. of here lies Mono Diggins, the first extensive placer mining excitement east of the Sierra. Cord Norst is generally credited with being the discoverer on July 4, 1859. A town, Monoville, boasted a transient population of 500 - 1000. A post office was established December 12, 1859, was closed by April 2, 1862, as the prospectors moved on to Aurora. One of the most ambitious hydraulic water projects of the time was the transportaiton of water from Virginia Creek to the Diggins by open ditches known as "The Mono Ditch." The remnants of the system may be seen by looking easterly from the highway summit or northerly from the bottom of the grade. Rattlesnake Gulch Road, Mono County, CA: 37000. You can just see the roof of a cabin in the center of the photograph. Bacon Gulch to Rattlesnake Gulch Road, Mono County, CA: near Rattlesnake Gulch. Field Notes: 26-Jun-07 at Sinnamon Cut. Rattlesnake Gulch Road, Mono County, CA: 35000. Wilson Creek enters the photo in the right middleground, comes laterally across the center of the photo through the far side of the meadow, and then turns southeast toward Mono Lake. I think it is likely that the meadow is artificially created by a ditch that comes from the powerhouse at the base of Copper Mountain. Field Notes: 4-Jun_06 near Conway Summit. A Checklist Flora of the Mono Lake Basin, Mono County, California and Mineral County, Nevada. : at Conway Summit. Cowtrack Mountain Road, Mono County, California: at top of mtn. South Tufa Area from a small hill near Panum Crater. The parking lot is behind the tree branch. Paoha Island from small hill near Panum Crater. West shoreline of Mono Lake. Field Notes: at 1-Aug-07 at Old Marina. Forest Road 01N44 “Southwest Shore Road,” Mono County, California: at road to Old Marina. Field Notes: 1-Aug-07 at Old Marina. A Checklist Flora of the Mono Lake Basin, Mono County, California and Mineral County, Nevada. : lakeside at Old Marina. The Northwest Shore of Mono Lake. Field Notes: 5-Jun-05 on CA Hwy 167. Highway 395, at the junction with California Highway 120. View north in US Highway 395 from Pumice Mine Road. Forest Road 1S160 (Former 1S437), Mono County, California: edge of Mono Basin. Forest Road 1S05, "Bald Mountain Road," Mono County, California: outside Mono Basin. Forest Road 1S160 (Former 1S437), Mono County, California: near Sagehen Mdws Rd. Forest Road 1N02 "Sagehen Meadows Road," Mono County, California: near 1S160. South end of Forest Road 1S88. Forest Road 1S05, "Bald Mountain Road," Mono County, California: at 1S88. Forest Road 1S88, Mono County, California: at 1S05. Forest Road 1N02 "Sagehen Meadows Road," Mono County, California: in Mono Basin. It wasn't all that clear to me whether this was a stabilized dune, or a moderately eroded beach strand. It could have been some of each. Number of Collections by Location. This map shows where plants have been collected in the Mono Basin. It was prepared by collecting events at each point described by latitude and longitude. See text for additional explanation. A Checklist Flora of the Mono Lake Basin, Mono County, California and Mineral County, Nevada. : Collection Localities. This popular geology field trip location is an example of soft sediment deformation of late Pleistocene - Holocene lake sediments, probably triggered by seismic shock. Cemetery Road, Forest Road 02N40, Mono County, California: above Mill Creek. Mono Lake to the south. This view was taken from Goat Ranch Cutoff, at the base of the Bodie Hills. A stabilized Mono Dune is visible in the middleground. The soil here was a mixture of wind-blown sand and metamorphic colluvium from the Bodie Hills. There were only Pinyons here, no Junipers. Inyo National Forest Road 3N14, Mono County, California, and Mineral County, Nevada. : Deep Wells. Field Notes: detour to Deep Wells. This photo was taken at the junction of Dobie Meadows Road and California Highway 167, and looks southeast across Mono Valley to the Adobe Hills and the White Mountains in the distance. California Highway 167: near Dobie Meadows Rd. Dobie Meadows Road, Mono County, California: near CA Hwy 167. Forest Road 1S05, "Bald Mountain Road," Mono County, California: inside Mono Basin. Outraged by the shooting of Sheriff Dolan, the citizenry of Mono County quickly organized a Sheriff's posse which tracked the outlaws to a location near Mono Craters. Justice was served when both outlaws were killed in a shootout with possemen. A coroner's inquest determined "death caused by resisting arrest by duly constituted representatives of the sheriff's office." Field Notes: 24-Jun-07 at Picnic Grounds Beach. U. S. Highway 395: near Picnic Grounds. The yellow sign says "Next 10 Miles." Unfortunately, we don't know what it's warning us about. Probably Sandy conditions. California Highway 167: near Nevada State Line. Sand dunes near Mono Lake. A road to the south gives access to the shore of Mono Lake and the sand dunes. There are sand dunes on both the north and south sides of California Highway 167 for several miles. A description of the Mono Dunes studied by Pavlik (1985) suggests that he studied the dunes to the north. California Highway 167: near Mono Dunes. Field Notes: 5-Jun-05 near Mono Dunes. Eastern Mojave Geology -- A Botanist's View: stabilized dunes. "120 Cutoff," Inyo Forest Road 1S06, Mono County, California: at FR 1S13. Forest Road 1S13, Mono County, California: at FR 1S06. This map shows where plants have been collected in the Mono Basin. It was prepared by collecting events at each point described by latitude and longitude. Collections made in the Upper Mono Basin (above 8400 feet) are excluded. Some data could not be accurately portrayed and was deleted. For example, some collections give the location as "Mono Lake" or even just "Mono Basin." It's impossible to know where to place a marker for these collections, and they are not shown on this map. Other data has been portrayed as accurately as can be, but may not be the actual place of collection. For example, all of Miss Maud Minthorn's collections give the location as "vicinity of Lundy." These are all plotted at Lundy. Other collections give only creek names as locations, such as "Lee Vining Creek." or "Rush Creek." These have been plotted on the deltas of those respective creeks, where they enter Mono Lake. Collections that have location descriptions such as "Lee Vining Creek near USFS Ranger Station" are plotted at the most specific point possible, in this case, at the Lee Vining Ranger Station in Lee Vining Canyon. 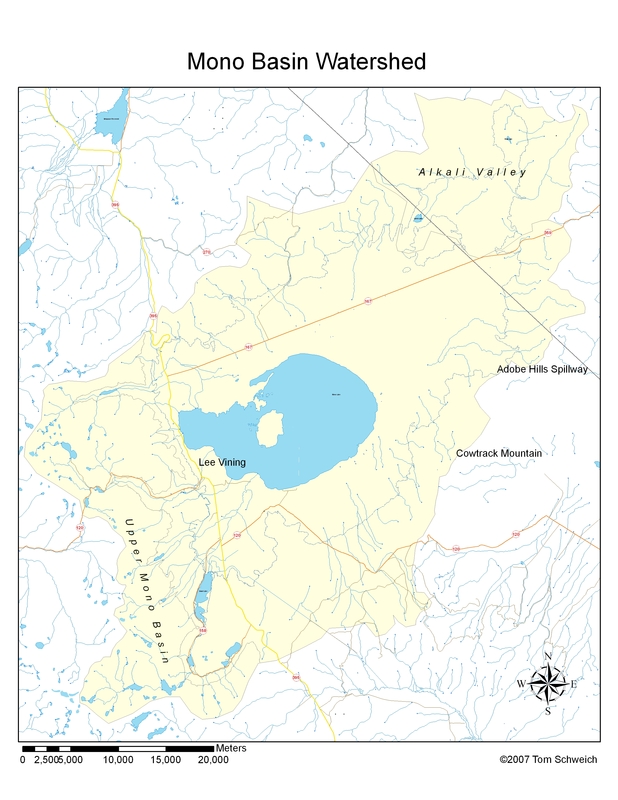 The map shows that there are many collections around the northwest shore of Mono Lake, in Lee Vining Canyon, and in Lundy Canyon. Big Sand Flat is also a popular collecting locality. Not unexpectedly, there are few collections from the eastern portions of the Mono Basin. I am a little surprised at how few collections there are in the Bodie Hills, along the north side of the basin. A Checklist Flora of the Mono Lake Basin, Mono County, California and Mineral County, Nevada. : Israel Russel. Mono Craters and the Sierra crest from a small hill near Crooked. This photo shows Lee Vining, westernmost Mono Lake, and US Highway 395 snaking along the shore. Taken at about 9:45 AM, the only time to get good lighting on this photo might be very early morning, sometime around the summer solstice. Humboldt-Toiyabe Forest Road 180 "Old Virginia Highway (in part)," Mono County, California: above Mono basin. Cemetery Road, Forest Road 02N40, Mono County, California: at Mono Lake Cemetery. Field Notes: Sunday, June 20, 2010. Photograph taken 14 July 2010. Field Notes: 14 Jul 2010. Mono Lake at Mono Lake County Park on north shore. Cemetery Road, Forest Road 02N40, Mono County, California: at Mono Lake County Park. Concert in Mono Lake County Park at conclusion of the 2010 Chautauqua. Field Notes: 20 Jun 2010. Singer-songwriters Keith Greeninger and Dayan Kai sing at the Mono Lake Chautauqua picnic. Two American Avocets in breeding plumage. Boardwalk to Mono Lake shore at Mono Lake County Park. "120 Cutoff," Inyo Forest Road 1S06, Mono County, California: near mdw. New interpretive display at Mono Mills. California Highway 120: at Mono Mills. Field Notes: 7 July 2009 near Mono Mills. Mill site at Mono Mills. Field Notes: 23 Sep 06 at Mono Mills. Location of turntable at Mono Mills. In the center of the photo is a steel post that has been squared off at the top, and there are many timbers at this location that have been squared off or notched in a unique way. Human enterprise in the Mono Lake basin. Inyo Forest Road 01N54 “East Shore Road”, Mono County, California: between dunes. Inyo Forest Road 01N54 “East Shore Road”, Mono County, California: at RR grade. Inyo Forest Road 01N54 “East Shore Road”, Mono County, California: in dune field. Forest Road 01N103, Inyo National Forest, Mono County, California: at 1N54. California Highway 270: at pass. Mount Biedeman from the north side. Field Notes: 26-Jun-07 in Bodie Hills. Sand tufa at Navy Beach. Sand tufa is formed when fresh water springs percolate through the sandy lake bed of an alkaline lake. Contact with the alkaline salts cause calcium carbonate in the fresh water to precipitate in the sand. If the lake level drops, the uncemented sand can be eroded away, either by water or wind, leaving the sand tufa behind. Field Notes: 2-Aug-08 at Navy Beach. During the Cold War, Mono County was home to one of many remote facilities used by the US military to test new weapons and weapon systems. A "secret military installation" operated by the US Navy was located along the south shoreline of Mono Lake. During the 1950s and 1960s several branches of the US armed forces utilized this test facility to conduct various research. Numerous top-secret exercises were actually performed here during what was called "seismic testing." However with the expansion of other nearby bases, growing public safety and environmental concerns, this facility soon outgrew its usefulness. In May 1962 all operations ceased and soon thereafter the facility was abandoned. Although many scientists, technicians, soldiers, and sailors worked at this installation for many years, all that remains today of their activities are a few remnants and the name "Navy Beach." This monument and plaque dedicated as a California sesquicentennial event. Test Station Road, Mono County, California: at historical plaque. California Highway 120: at Mobil Station. This perspective shows how little water separates Negit Island from the mainland with a lower lake level. Obsidian chunk on the south side of Obsidian Dome. Forest Road 02S11 "Section 21 Timber," Mono County, CA: s. of dome. Forest Road 02S79 "Obsidian Loop," Mono County, CA: near Obsidian Dome. Field Notes: 7 July 2009 near Panum Crater. California Highway 120: at 1N11. Paoha Island on a rainy Summer afternoon. The valley in the foreground is the Parker Creek drainage. The long low ridge in the right middleground is the glacial moraine on the south side of Bloody Canyon, and the mountain in the backgorund is Mount Gibbs. Forest Road 01S25, "Parker Creek Road," Inyo National Forest, Mono County, California: on Parker Lk Rd. Field Notes: 2-Aug-07 near Parker Ck. From right to left are Parker Canyon, Parker Peak and Mount Wood, then the canyon of Rush Creek and June Lakes Loop at left. U. S. Highway 395: near Rush Creek. Parker Creek just below Parker Lake. Parker Lake Trail, Mono County, California: 57000. Forest Road 01S25, "Parker Creek Road," Inyo National Forest, Mono County, California: 2-Aug-07 near Parker Ck. Old Highway 395, Mono County, California: at Parker Ck. Inyo National Forest Road 1S25A, Parker Lake Trailhead Road, Mono County, California: near end of road. Field Notes: 2-Aug-07 at Parker Lk Trlhd..
U. S. Highway 395: at Picnic Grounds Road. "Pilot Spring Road," Forest Road 1S04, Mono County, California: Pilot Spring. The columbines were in the sediments above the dam, and in several places below the dam. "Pilot Spring Road," Forest Road 1S04, Mono County, California: near Taylor Cyn Rd. "Taylor Canyon Road," Inyo Forest Road 1S17, Mono County, California: near Pilot Sprs Rd. Inyo Forest Road 1N18, "Crater Mountain," Mono County, California: part way up the road. This is also habitat for Lupinus duranii. Inyo Forest Road 1N11, "120 - 1S35 Connect," Inyo National Forest, Mono County, California: edge of burn. North end of Forest Road 1N11. Inyo Forest Road 1N11, "120 - 1S35 Connect," Inyo National Forest, Mono County, California: at CA Hwy 120. West Portal Road, Mono County, California: 49900. Photograph looks east from Bohler Canyon, across Pumice Valley. Mono Lake can be seen at left. Panum Crater is just left of center in the middleground. The distant skyline in the center is Cowtrack Mountain. And, the Mono Craters are in the right middleground. Forest Road 01N106A, Mono County, California: in Bohler Cyn. Forest Road 1S52, Mono County, California: 47000. View southeast on 1S52, which may have been the Old Mono Highway in 1954. Forest Road 1S52, Mono County, California: 46100. View west across Pumice Valley. "Pumice Mine Road," Inyo Forest Road 1S40, Mono County, California: at Punch Bowl. Inyo Forest Road 1N127, Mono County, California: near saddle. Inyo Forest Road 01S91 “Old Stationhouse Road,” Mono County, California: w. side of flat. Field Notes: w. side of flat. Inyo Forest Road 01S92 “Old Railroad Loop Road,” Mono County, California: e. side of flat. Field Notes: 20 Jun 2013. "120 Cutoff," Inyo Forest Road 1S06, Mono County, California: at s.e. edge of flat. Rattlesnake Gulch Road, Mono County, CA: at upper cabin. Rattlesnake Gulch is a great name for a plant collection location. Reversed Peak, and San Joaquin Mountain, from near Farrington's. The peak in the middleground is Reversed Peak. The peak in the center distance is San Joaquin Mountain, the furthest southwest point of the Mono Lake hydrological basin. Oil Plant Road, Mono County, California: along Oil Plant Road. Field Notes: 2-Aug-07 along Oil Plant Road. The way up Reversed Peak. Rush Creek Road, Mono County, California: near parking area. Field Notes: along Rush Ck. Inyo Forest Road 1N29, "Grant Lake Cut-Off," Mono County, California: at gatehouse. Rush Creek on downstream side of Test Station Road. Field Notes: 2-Aug-07 at Rush Creek. Field Notes: 2-Aug-07 at Rush Ck. Field Notes: 2-Aug-08 at Rush Ck. We are conducting a radio tagging - movement study of brown trout in Rush Creek to better understand seasonal movements and habitat preferences. Please do not disturb the antennas as these are critical to the success of our two-year long study. Thank you for your cooperation. Ken Knudson at (406) 442-5399. Photograph taken 1 September 2010. Rush Creek Road, Mono County, California: 40000. Field Notes: 1 Sep 2010. A Checklist Flora of the Mono Lake Basin, Mono County, California and Mineral County, Nevada. : along Rush Ck. Test Station Road, Mono County, California: at former rd. Does Seaside Heliotrope (Heliotropium curvassicum L.) occur in the Mono Lake Basin? : 7. Field Notes: 2-Aug-07 at Rush Ck.. Good-looking antenna installation at the Rush Creek gaging station. Rush Creek Delta Trail, East, Mono County, California: in the creek. Rush Creek Delta Trail, East, Mono County, California: at end. Who is that guy? And, what's he doing at the Rush Creek delta? Field Notes: 26 Aug 2012. Rush Creek Delta Trail, East, Mono County, California: in sight of end. Rush Creek Delta Trail, East, Mono County, California: on strand. Saddlebag Lake Road, Mono County, California: at Saddlebag Lake. Field Notes: 22-Sep-06 at Saddlebag Lake. Forest Road 01N02A, “Sagehen Meadow Campground Road,” Mono County, California: Sagehen Meadow Campground. Forest Road 01N02A, “Sagehen Meadow Campground Road,” Mono County, California: Sagehen Spring. Field Notes: 21 May 2013. California Highway 158: below Silver Lk. A Checklist Flora of the Mono Lake Basin, Mono County, California and Mineral County, Nevada. : 111016090. Nevada Street, Mono County, California: near trlhd. California Highway 158: along Silver Lk. A Checklist Flora of the Mono Lake Basin, Mono County, California and Mineral County, Nevada. : Rainier Pleated Gentian. Snow Ponds on the southwest flank of Reversed Peak. A Checklist Flora of the Mono Lake Basin, Mono County, California and Mineral County, Nevada. : Snow Ponds. Ephemeral pond, one of the Snow Ponds. Osprey with nest on tufa. Test Station Road, Mono County, California: near South Tufa. Test Station Road, Mono County, California: along shore of Mono Lake. Tufa towers in late afternoon sun. Field Notes: 20070801140. 25 Jun 2015. Field Notes: 9 Jul 2010. Field Notes: Thursday, June 25th. South tufa in June 2015. On September 28, 1994, the California State Water Resources Control Board set a target lake level of 6,392 feet, 25 feet below its 1941 level. The decision decreased water diversions by Los Angeles's Department of Water and Power (DWP) from four Mono Lake tributaries. This decision was made “in accord with the Court's mandate to protect public trust resouces where feasible and the mandate of the California Constitution to maximize the reasonable and bebeficial use of California's limited water resources.” The Board also ordered DWP to prepare and implement plans to restore damaged streams and waterfowl habitat. When the Lake reaches its mandated level of 6,392 feet, this panel will be at water's edge. Forest Road 3N06, Inyo National Forest, Mono County, California: at Sulphur Pond. Field Notes: 20 Jun 2012 at Sulphur Pond. A Checklist Flora of the Mono Lake Basin, Mono County, California and Mineral County, Nevada. : at Sulphur Pond. Photograph taken in the early morning hours of August 3, 2007. Composite of five photographs, showing the three species of orchid found at lakeside in the delta of Andy Thompson Creek. Trench Canyon Road: at CA/NV boundary. This view looks northeast through Trench Canyon from the southwest end. Larkin Lake is just through the little draw in the middleground at the opposite end of Trench Canyon. Mount Hicks is the peak in the left background. The southwest end of Trench Canyon is very sandy. Presumably the mouth of the canyon is a dune built up from sand blown from Mono Lake. The crest of the dune is about 180 feet higher than the current floor of Trench Canyon. Trench Canyon Road: at SW of Trench Cyn. Inyo National Forest Road 01N16, "Horse Meadows / Gibbs Trailhead," Mono County, California: on the edge of U. Horse Mdw. Inyo National Forest Road 01N16, "Horse Meadows / Gibbs Trailhead," Mono County, California: at TH. A Checklist Flora of the Mono Lake Basin, Mono County, California and Mineral County, Nevada. : kinds of vegetation. Last Saturday in April through November 15. Zero limit - NO fish may be taken! All trout must be returned to the water alive! Forest Road 01N17, "Farrington Siphon," Mono County, California: at Walker Ck. Forest Road 01N17, "Farrington Siphon," Mono County, California: near Walker Ck. Photograph taken August 2, 2007. It was raining lightly when the photo was taken. Forest Road 01S23 "Walker Lake Trailhead," Mono County, CA: at end. Does Seaside Heliotrope (Heliotropium curvassicum L.) occur in the Mono Lake Basin? : 5. A Checklist Flora of the Mono Lake Basin, Mono County, California and Mineral County, Nevada. : near Walker Lk. Inyo Forest Road 01N54 “East Shore Road”, Mono County, California: Warm Springs. Field Notes: Coll. No. 1159-1162. A Checklist Flora of the Mono Lake Basin, Mono County, California and Mineral County, Nevada. : Warm Springs. "Pumice Mine Road," Inyo Forest Road 1S40, Mono County, California: near Punch Bowl. Wilson Butte from Glass Flow Road on the south side. Panorama of Wilson Butte sand flat. Cemetery Road, Forest Road 02N40, Mono County, California: near Wilson Creek. Mill Creek Powerhouse Road, Mono County, California: 65000.